Women’s soccer players celebrate a goal during the team’s game against Liberty in August. Women’s soccer begins their quest for a conference championship Saturday afternoon, playing at Duquesne in the first round of the Atlantic 10 tournament. The Colonials enter the tournament as the fifth seed after finishing with a conference record of 5-2-3, just behind the Dukes at 6-3-1. 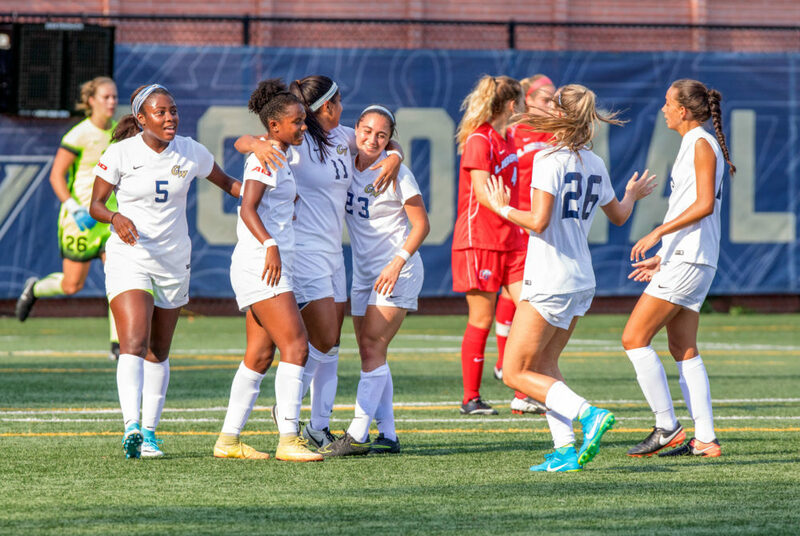 GW played Duquesne to a scoreless draw in two overtime periods during its last regular season game on Senior Day Sunday afternoon, with both teams jostling for the better postseason position. The draw earned the Dukes the fourth seed as well as a crucial quarterfinal home game. Head coach Sarah Barnes said playing Duquesne twice in less than a week makes the preparation for Saturday’s game easier. During the Colonials’ last game against Duquesne, they struggled to contain their opponent and were unable to build out of the back. Although GW heads on the road this weekend, the team finished the regular season with a 6-2-1 record away from home, including road victories over Dayton and Richmond in the past two weeks. In order to continue their season, the Colonials may have to find alternate ways of getting on the score sheet. They have managed to score just one goal in their last four games of the season after only getting shut out twice during their first 13 games. Much of GW’s offensive clout comes from their attacking players, as junior midfielder Sofia Pavon leads the squad with eight goals, while senior forward Brittany Cooper and freshman winger Alexis Williams hold four apiece. The trio accounted for 16 of GW’s 21 goals this season. After graduating former program standouts including MacKenzie Cowley, Kate Elson and Brooke Bean, the team has had to integrate younger talent into the lineup and speed up the learning curve for the underclassmen. For the most part, they have exceeded expectations. Williams has been successful as a two-way player while first-year substitutes like midfielders Natalie Silberman and Kelly Amador, and forward Tuhina Dasgupta have all played crucial minutes in conference matchups. While relying heavily on contributions from newcomers, the Colonials look to their upperclassmen for leadership as the team enters the post season. Cooper and redshirt senior goalkeeper Miranda Horn are among the most experienced players on the team, but GW has also drawn on the communication and leadership skills of junior captains Megan McCormick and Mia Barreda, as well as junior defender Dani Frese, all in their second years as starters for the squad. GW’s No. 5 seed comes after a 0-2-1 start to the year that included a 4-0 loss to Georgetown in the season opener. The Colonials turned around their momentum and finished the year with eight shutouts in their final 10 games. If the Colonials defeat the Dukes, they will square off against the winner of La Salle and Dayton in the semifinals Nov. 3. The Colonials blanked Dayton 1-0 on Oct. 15, but have not played the top-seeded Explorers.